Jane Wodening’s stories and articles have been published in magazines, little and big, in an almanac, in chapbooks, several anthologies and in seven slim volumes, while the big books accumulated on the top shelf of the coat closet. 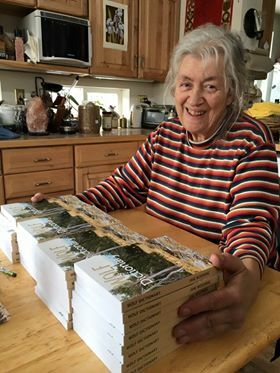 “After I made Living Up There in my early 70’s, a memoir of several years I had spent living alone in a little cabin at 10,000 feet in the Rockies, I pulled down three old manuscripts from a high shelf and realized that in a few years I would be 80 and if I didn’t pull these books into a presentable form and send them out into the world, they’d never exist as books. I was in cleaning mode. Should I toss them? Or should I spend a few years on these manuscripts? I chose the latter.The encouragement was that Janette Taylor of Sockwood Press wanted to publish my work. The whip was my age.